not participate in or encourage electronic piracy of copyrighted materials. Copyright © 2005by Grosset & Dunlap. All rights reserved. 345Hudson Street, New York, New York 10014. GROSSET & DUNLAP is a trademark of Penguin Group (USA) Inc.
Hey there! I can’t remember the last time I picked up a pen and paper to write an honest-to-goodness letter, but desperate times call for desperate measures, I guess. I have no idea whether or not there will be any computer access at—ugh, it’s too torturous to oven think a&out—CAMP Mom insists that it won’t be as backwoods as I’M expecting, but at this point I’M not sure I trust her! I Mean, really—sending Me away to Nowheresville, Pennsylvania, for eight weeks? She is obviously having some sort of mental breakdown, and I’m the one who’s going to suffer! You’re so lucky your parents are taking you to Europe. I know you’re not that excited about all of the touring around (dusty old paintings and all) but seriously, it has to be better than painting clay pots and identifying different poisonous leaves and whatever else they do at camp all summer long. Promise me you’ll take lots of pics of your gorgeous self being all cool and sophisticated in front of the Mona Lisa, Big Ben, the Trevi fountain . . .
Have I Mentioned that I’M way jealous? I think we’re about an hour from Camp Lake-puke—joy—so I’m going to put down My pen and start “rethinking My attitude,” as Mom suggested. She is totally convinced that the fresh air will do Me good. I pointed out that if fresh air was so important, we wouldn’t live in Manhattan, but somehow she didn’t see things my way. There is a girl sitting two seats in front of me with awesome clips in her hair. Like little sequins or something. She has the thickest Mess of curly red hair I’ve ever seen. And I bet it’s her natural color. Anyway, the barrettes are promising. Maybe I’ll go Make friends. Or not. You better Miss Me! Cross your fingers that this summer is as painless as possible and that we’re back in NYC before we even know it (even if it Means school again)! 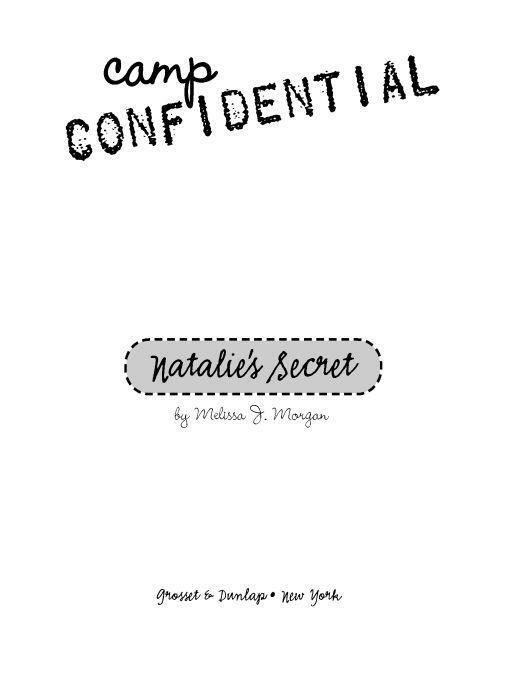 Natalie signed her letter, folded the crisp lavender sheet of paper into a neat square, and tucked it into the front pocket of her bag with a sigh. Her envelopes and stamps were all packed away in her trunk, which had been shipped separately a week before. Hopefully, her things would be waiting for her when she arrived at camp. Camp Lakeview. It was all Natalie could do not to shudder at the thought of it. To say that she was not interested in nature was a severe understatement. In fact, Natalie was pretty sure that she was actually allergic to nature. Natalie and her mother lived in the “concrete jungle”—the coolest, most interesting city in the world—New York. The closest Natalie ever came to the great outdoors was when she and her friends went Rollerblading in Central Park on weekends. And that was just fine by her. “What’s wrong with the people I know now?” Natalie had asked. “I like my horizons narrow,” Natalie had protested stubbornly. But her mother’s word was final. That conversation had taken place five months ago. Now, Natalie’s mind raced as the stuffy charter bus she rode careened down the highway toward Camp Lakeview. Endless grassy pastures dotted the landscape, and she had even seen a few cows and sheep grazing. , for Pete’s sake. Was this what her mother meant about broader horizons? She could go home now, right? Natalie glanced at the other kids on the bus. She couldn’t believe that there wasn’t anyone on the bus as miserable as she was, but looking around, most of the other kids were grinning away, laughing, talking to one another . . . Natalie didn’t know a soul here. She wasn’t especially shy, but she also wasn’t thrilled at the prospect of having to make all new friends. Her own friends were cool, and other than Hannah, they were all back in New York City taking a drama intensive offered by a special high school for teenage actors. Everyone was there. Including Kyle Taylor. Kyle Taylor who had, it should be noted, promised to write Natalie over the summer. Which, how could he not, what with me out in the wilderness with the lions and tigers and bears and whatever. He would have let me go to acting school, definitely. But as quickly as the thought had popped up, Natalie pushed it out of her mind. Talking to her father was Out of the Question. He and her mother had split up when Natalie was only four years old, and even though Natalie knew her father loved her, they didn’t talk very often. It was hard to be in touch with him because . . . no, she wasn’t going to think about it. Talking to her father was, at least for right now, a non-option, and therefore, she’d just have to pray that Camp Lake-puke, as she had come to think of the place, wasn’t as bad as she feared. Natalie snapped out of her little daze to see Cool Barrette Girl smiling at her. Well, in her general direction, anyway. Natalie took her chances and smiled back. Success. Barrette Girl stood up from her seat, stretched, and wove her way back to where Natalie sat. “Hi,” she said, still grinning, “I’m Grace Matthews. I’m from New Jersey. Montvale. It’s in the north, right by the George Washington Bridge.” She stuck out her hand to shake, which seemed a little weird to Natalie. The only people she knew who shook hands were grown-ups—but, hey—she wasn’t about to start turning away friendly faces. She reached out her own hand toward Grace. “I’m Natalie Goode,” she said. was totally new and strange to her. “So, yeah, I’m new,” she finished, feeling sort of lame. “Oh, hey, no—we’ve got tons of trees where I come from. I mean, there’s a tree right outside my building,” Natalie said, hoping Grace would get that she was kidding. “Yeah, cool,” Natalie agreed, hoping she didn’t sound as unexcited as she felt. She knew that trees and new people weren’t such a bad thing, but somehow, she just couldn’t get her enthusiasm together. Grace rolled her eyes, pretending to be impatient. “Right, hangman. Really important stuff. Do you want to play?” she offered. “Gotcha,” Grace said, giggling again. “Well, if you change your mind, I’m just a few seats ahead.” She made her way up toward the chattering girls, leaving Natalie alone with her own thoughts again. Seated in the window seat next to Natalie was a very quiet girl with long, jet-black hair. This girl was hunched over a notebook, scribbling away intently. She hadn’t said one word to anyone since they boarded two hours ago, just opened up her notebook and retreated into her own world. She hadn’t even looked up when Grace came over to say hi. Natalie couldn’t decide how she felt about her seatmate. The fact that this girl was dressed in jeans and a ripped black T-shirt while everyone else was in shorts and tank tops could either be cool or weird. The same went for her refusal to look up and make conversation. Natalie was dying to know what she was writing in her notebook. Lots of her friends from New York were into art and writing and liked to dress differently and wear cool jewelry. So this girl could definitely be sort of cool. Or she could be a total weirdo. It could really go either way. Natalie cringed. “Call me old-fashioned, but I prefer my tuna without any surprises,” she mumbled. She was surprised to hear a snort from her right and looked over to see her seatmate stifling a chuckle. “Agreed,” the girl said. She quickly went back to her notebook, as if afraid she had said too much. Natalie was so shocked by the sudden burst of conversation that she forgot to reply. But she didn’t have time to, anyway, because Pete was still talking.